1. In a small non-reactive sauce pan, heat rice wine vinegar, sugar and salt until sugar and salt melt completely. Remove from heat and cool. 2. For braised shiitake mushroom: In a small sauce pan, add water, soy sauce, sugar and mirin. Add sliced shiitake mushrooms and cook slowly until the shiitake soaks up the liquid for 10 minutes. Remove from heat and cool. 3. For egg omelet: Mix egg and water well. In a small fry pan, add a small amount of oil and wipe the pan with kitchen paper before heating at medium heat. Add half of the egg in the pan and quickly tilt the pan in a circular motion to coat egg mixture evenly to make very thin round egg omelet. When the edge of the egg is dry and comes off from the pan, flip the egg carefully with fingers and cook the other side another 30 seconds. Slide it on a plate and cool. Do the same for another one. Once they are cool, roll the eggs to shape a thin log. Set aside. 4. When the vinegar mixture is cool, take the hot cooked rice and spread it gently with a spatula around a large bowl and sprinkle in a tiny amount of vinegar and mix. Continue adding more vinegar until all the rice is dressed with vinegar (about 1.5 tablespoon vinegar mix). Cover with a damp kitchen towel then plastic wrap and set aside. Do not refrigerate the rice. note: When you mix rice and vinegar, flick your wrist gently to cut and fold the rice and vinegar together rather than stirring to prevent smashing the rice. While you are mixing, fan the mixture with a piece of thick paper or magazine or whatever to put some air in to cool the rice. 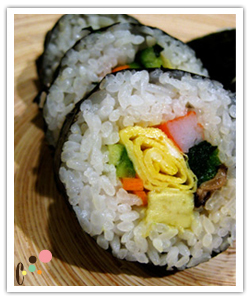 This prevents the rice from becoming mushy sticky and instead produces fluffy and shiny sushi rice. 5. For carrot: In a small bowl, mix leftover vinegar mixture and carrot and set aside. 6. 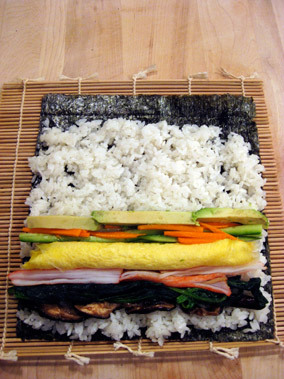 Assemble: Place a sushi-roll mat on a cutting board. The bamboo strips should be in a horizontal position for you to be able to roll. Place one nori on the rolling mat shiny side down. 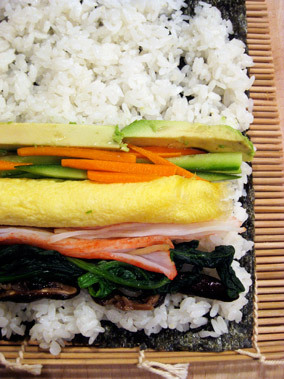 Spread half of the rice on top evenly with wet hands. Leave about a inch at the top of the nori empty of the rice. Arrange all fillings on the edge close to you. Do not put too much otherwise, you can't roll. 7. Roll : Using the rolling mat, carefully lift the edge and start rolling. Each time you roll, press the rolling mat to make a tight roll. Make sure not to roll the rolling mat! Give another squeeze when it's completely rolled. 8. With a slightly wet, very sharp knife, you can cut the into 6 pieces without squish. Or you can eat it whole - but only if it is Setsubun!